Subject matter specialists: Meet and travel with chefs, artists, historians, and – of course! – wine specialists, who will share their experience and engage your curiosity. Small group experiences: Leave the crowds behind and travel with four to ten others who share your interests. Destinations that tell a story: Visit the unique, the culturally rich, and the out-of-the way places that tourists would never find. Exclusive access: Experience behind-the-scenes visits to sites and join informal gatherings with locals. Pre-excursion preparation: Enjoy an extended relationship in which YK2B offers routine advance planning information, as well as interesting videos and information to help you make the most of your time in Burgundy. 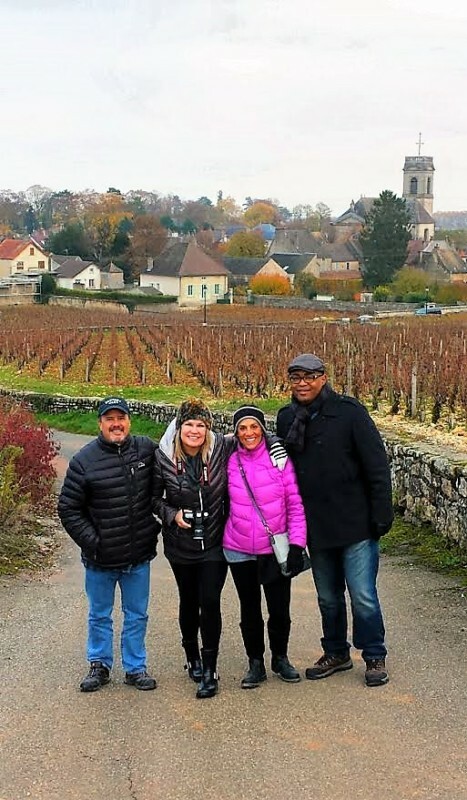 And, in addition to Your Key to Burgundy’s publicly-offered excursions, we can custom-design one just for your group, focused on your specific interests. Contact us to learn about how we can work with you to create your once-in-a-lifetime experience in one of the world’s newest UNESCO World Heritage Sites! Click HERE to read what our previous guests have to say about their experiences with us. “Five Facets of Burgundy” – All new for 2019, a 9-night journey – November 7 to 16 – through five of Burgundy’s legendary wine-growing regions, from Chablis in the north, to the Mâconnais in the south. “Joie de Vivre: Life, Laughter, and the French Paradox” – Each year, we are pleased to offer a guided excursion designed just for women. We are pleased to announce our 3rd annual “Women in Burgundy” excursion, to take place October 9 to 19. “Hospices de Beaune Wine Auction Adventure” – Every Burgundian knows that the 3rd weekend in November is one of the most celebrated and joyful times of the year in Burgundy. We hope you will join us for all of the festivities of the 159th annual Hospices de Beaune wine auction. And don’t forget our completely customized, themed excursions… – We are continuing to develop wonderful partnerships with artists, historians, educators, and other professionals, in many disciplines. Come to us with your group of four to six travelers, tell us about your interests, and we will custom-design a themed excursion, just for you! Remember, that with the exception of our independent excursion packages, all Your Key to Burgundy excursions are privately guided and chauffeured, providing exclusive, highly-personalized service. Concierge services of Your Key to Burgundy are included in all packages to assist you to plan additional aspects of your trip. Excursions do not include airfare. Contact us for complete itinerary information. Send us a note if you would like to be among the first to receive information about exciting events and opportunities to travel with Your Key to Burgundy. $4,550 per guest, limited to six guests. Only two spaces left! Seven nights in Pommard, plus three nights in Paris. The joy of living! That is the theme of our 3rd annual YK2B excursion, designed just for women. Carolyn and up to six “wander-ful” women will experience the best of Burgundy as they participate in the vibrancy of village life. Focusing on food, fun, and friendship (and of course, wine! ), we will explore the French paradox as we shop at local markets, visit inspiring sites, walk in the golden vineyards of autumn, and meet passionate winemakers, chefs, and business owners who share a zest for life. Includes an arrival night in Paris to help you to ease in to your adventure! This excursion is ideal for solo travelers, as this experience is all about self-rejuvenation and making new friends! A wine-lover’s “dream” journey through five of Burgundy’s most famous wine-producing areas. Seven nights in Burgundy, plus two “bonus nights” in a 4-star hotel in Central Paris. From Chablis in the north to the Mâconnais in the south, we will taste our way along Burgundy’s famous “Route des Grands Crus.” With the town of Beaune as our home base, we will explore the cultural richness of the region, including wine history dating back more than 2,000 years. Visits to towns, villages, and historic sites will reveal the story of how Burgundy came to be the most celebrated wine-growing region in the world! This excursion is ideal for wine lovers and history lovers, alike! Hospices de Beaune Wine Auction Trip of a Lifetime! $10,500 per couple, limited to three couples. Presenting a trip-of-a-lifetime experience at the 159th edition of the most famous wine auction in the world. Join us for a rare opportunity to experience Burgundy’s wine, food, history, and culture during “Les Trois Glorieuses,” the most famous wine auction that takes place each year in Beaune over the 3rd weekend in November. We will serve as your personal guides as we explore the Cote d’Or, taste wine with some of the regions most celebrated small producers, and join in the party during the most festive weekend of the Burgundy year. A trip like no other for those who love Burgundy’s wine and history. This excursion is a Burgundy-lover’s dream come true! An independent excursion starting at just $2,500 for two guests. Especially designed for travelers who value independence and flexibility, this package can be arranged for the time of year that works best for you. Winter, spring, summer, or fall – there is always something special to discover in Burgundy. Simply select the time of year and your preferred dates, and it will be our pleasure to work with you to customize your experience as we make all the arrangements. This can be an ideal experience for families with children!